Gov. Pat Quinn says attorneys representing the state will be ready to defend their position in a lawsuit scrutinizing hiring in his Department of Transportation. Film festivals often seek to expose little-known work, and bring them to a larger audience. One in Urbana this week also challenges the fan to make his or her own movie. 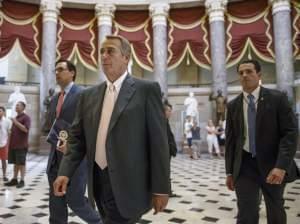 The House passed a resolution this evening authorizing Speaker John Boehner's lawsuit against President Obama. The 225-201 vote fell nearly along party lines, with five Republicans joining Democrats to vote "no." Two new attacks in Gaza have pushed the Palestinian death toll above 1,300 in more than three weeks of fighting. Champaign Police report additional charges --- and another arrest --- in connection with the June 24th murder of Allen Redding in the Garden Hills neighborhood. A homeless woman was undergoing surgery Wednesday morning, after being critically injured in a shooting in northwest Urbana. A professor of labor relations says the NCAA’s approval of a proposed settlement of a lawsuit over head injuries is good news in that it would obligate schools to have safety protocols for athletes. But Michael LeRoy thought the amount would be more. The Commerce Department had some good news about the U.S. economy today: Rebounding from a quarter of negative growth, Commerce said the country's gross domestic product expanded at a 4 percent annual rate during the second quarter. Strict limits will be in place when the Indiana State Fair sells alcoholic drinks for the first since 1946 when its 17-day run begins Friday. A federal judge in Chicago stopped short of granting preliminary approval for class-action concussions settlement against the NCAA. He says he needs more time to decide if it's a good deal.